I never have really been an applesauce girl so to speak. However, I’m definitely a “warm apple pie filling poured over a 100 calorie cup of vanilla ice cream” kind of girl. 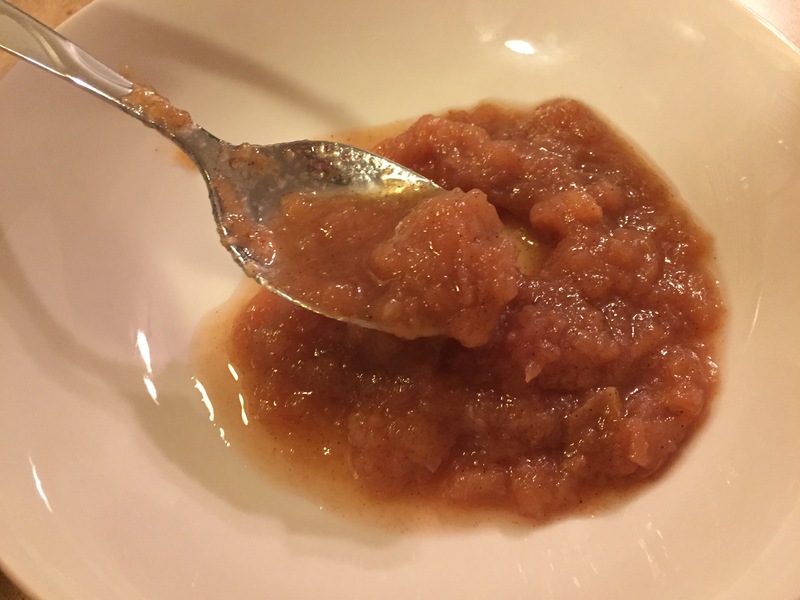 And I decided to make homemade apple sauce tonight, which turned out really delicious. But before I put it in the fridge to cool for tomorrow night’s dinner, i snuck a half cup while it was still warm and it was glorious! Again, I’ll give you both the crock pot and the instant pot versions below. Mix all ingredients together in crock pot, and heat on high 3 hrs, or low 6 hrs. Once time is up, open lid and stir apples until they have broken up and sort of melded together. Sauce will be chunky. Use an immersion blender to break up chunks until sauce reaches desired consistency. You can dump the sauce into a food processor or blender as well, but listen. LISTEN to me. Do not fill more than 1/2 way at a time with hot apples, or it will blow boiling hot apples all over you when you push the button. Trust me. This is why i use the immersion blender. You can cook the apples down a little longer if you find there’s more juice than you want. Serve hot or cold in 1/2 cup serving sizes. Mix all ingredients (except lemon juice) together in instant pot. Use the manual setting to cook for 5 minutes at high pressure. Once cooking is complete, use the pressure dial to release the steam (QR). Once steam is released, open lid and stir apples until they have broken up and sort of melded together. Sauce will be chunky. You can cook the apples down a little longer on the saute or keep warm setting if you find there’s more juice than you want. If you plan to serve cold, sauce will thicken in some in the fridge. Editors Note: This sauce is sweet, and I love it that way. If you wanted to make this unsweetened by omitting the brown sugar, your 8 servings would come out to 124 calories each. Editors Note: I actually left the peels on half of my apples, but the peels stayed in tact when i blended them all together, which i don’t mind at all… but you know… kids. So next time I’ll probably peel them all. If you’re using the blender or food processor, i wouldn’t even bother peeling them. Tonight my family asked for breakfast for dinner (which is not unusual in this house). I wanted to do something a little different, so we went with Open Face Sandwiches. I know that this recipe calls for packaged instant gravy (GASP!) which is almost a deadly sin in the American south (and in my home particularly). I chose to go this route for 2 reasons. 1. Packaged instant gravy is much lower in calories than homemade white gravy, and 2. it’s easier, and on a weeknight, time is precious. I used some pretty specific brand name ingredients here, but i’ll list the calorie counts for what i used, in case you’d like to use an alternative brand, or these items are not available in your area. 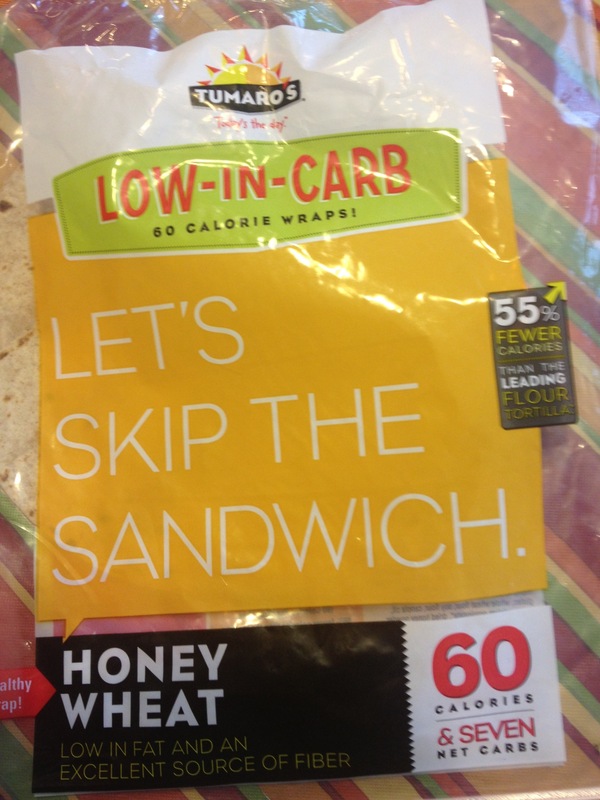 I usually like to stay around 250 calories or less for breakfast, so this works better as a lunch or dinner option for me. However, you could lower the calories by using 2 slices of canadian bacon instead of sausage, or using only egg whites. 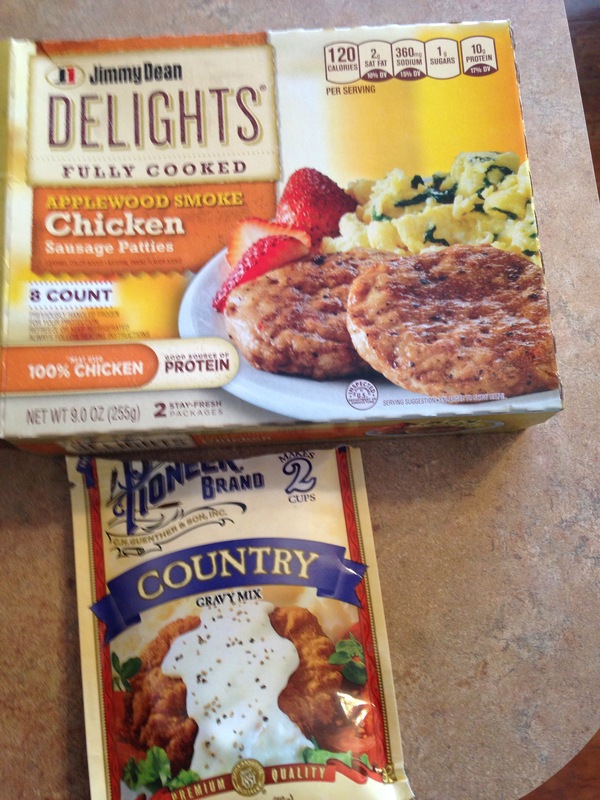 Cook sausage patties according to directions on package. Prepare gravy according to instructions on packet. Stir in salt. Mix eggs and egg whites together and whisk until blended. In a large skillet, spray non stick cooking spray, and scramble your egg mixture on medium heat until eggs are done. Season eggs with salt and pepper if you wish. 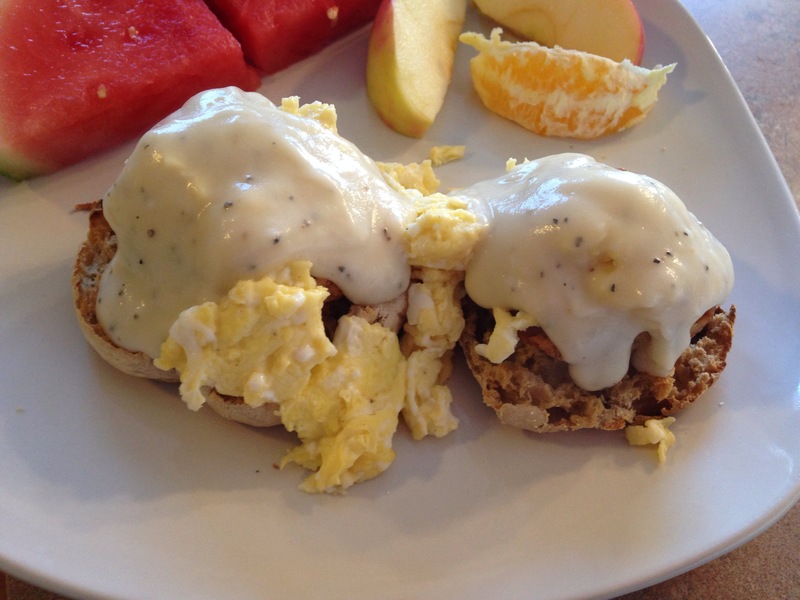 While eggs are cooking, split your english muffins and toast them all in the toaster, or on broil in the oven. To assemble sandwiches, place 1 muffin top, and 1 bottom on each plate. Top each muffin with a sausage patty. Divide eggs evenly between each of the 8 muffin pieces. Top plate with 1/3 cup of gravy, split evenly between the 2 muffins. Approximately 9 weight watchers points plus per serving. So, I love the egg white delight at McDonald’s for breakfast. It’s filling, and pretty reasonable at 250 calories. However, on days when I’m home I sometimes make these for myself, and at a much lower calorie count. Notes: 1 egg white is less than what comes on the mcdonalds version, so I use 2. But if you like it lighter on egg, the 1 is good. American cheese varies significantly from one friend to another in calorie count. I used a velveeta single. Try pepper jack singles for a bit of variety. They’re my favorite! 1. Spray a small skitter with nonstick spray and heat Canadian bacon. 2. Remove bacon and use same skillet to “fry” the egg whites, folding them over to make them about the size of the English muffin. 3. 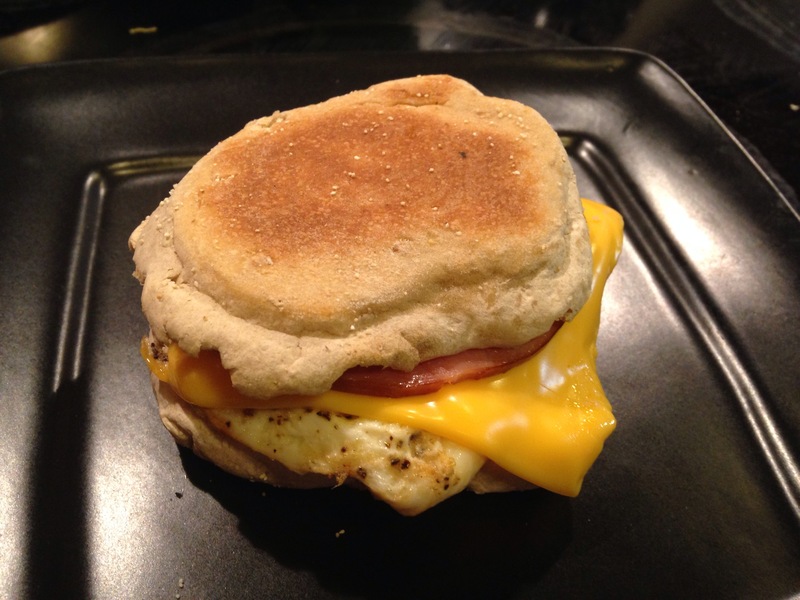 Once the eggs are cooked through, add cheese to the top, and place egg and cheese on the bottom toasted English muffin. This was pretty good, and it was really quick. 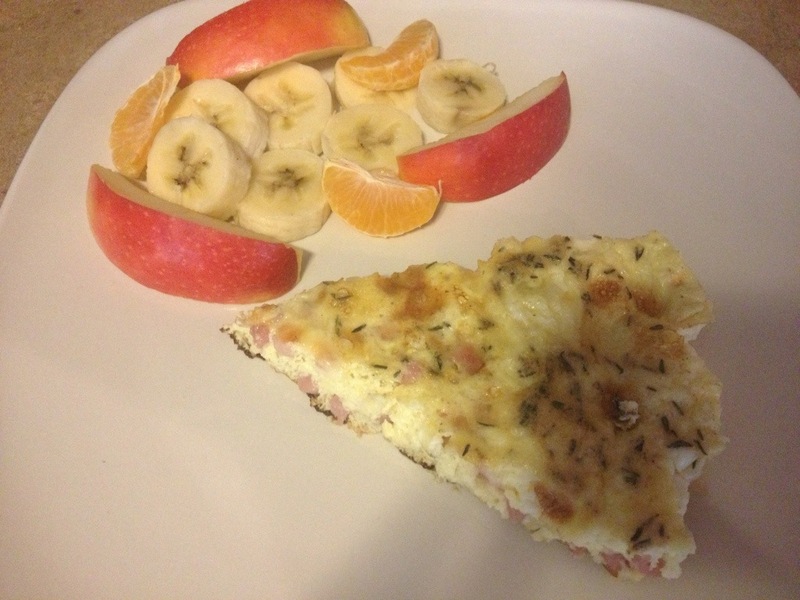 I served it with some fresh fruit in a 1/8 serving size, but it’s pretty low-cal and full of protein, so i’ll list different serving sizes today, in case you’re a little hungrier 🙂 Great for Breakfast, Brunch, or Dinner, and Frittatas are versatile, so I’ll be posting more versions with different ingredients in the future. Editors Note: I used a 10 Inch cast Iron skillet for this. I’m not sure how else you could make it, because of the high heat needed to finish this in the oven. Most oven-safe skillets are only “oven safe” to a certain temperature, so be sure yours will work in the oven. 1. Preheat oven to broil. 2. Heat oil in your cast iron skillet, on a medium setting on the stovetop. Sautee onions and diced ham until onions become translucent. 3. In a medium bowl, mix egg whites, eggs, milk, salt, pepper, and thyme. Whisk until everything is well blended. 4. Once onions and ham have been sauteed, spread them in an even layer in the skillet, and cover with the sliced havarti cheese. 5. 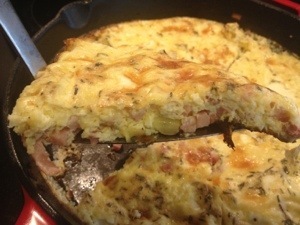 Pour egg mixture over the top of the ham, onions and cheese and cook on medium on the stovetop 3-4 minutes until eggs appear to be set on the bottom, and are beginning to set through the middle. Don’t stir the eggs. Pay attention here to the heat. If your heat is too high your eggs will scorch. I set mine on about 4-5 on a 1-10 setting. 6. CAUTION: USE A POT HOLDER: The skillet handle will get very hot both on the stovetop, and of course, in the oven. After bottom and middle of eggs have begun to set, place the whole skillet into the oven and allow it to broil 4-6 additional minutes. 7. Remove from oven when eggs appear set all the way through and top has just begun to turn golden in spots. 8. 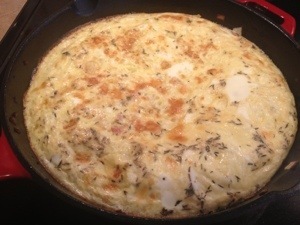 Allow to cool about 5 minutes before slicing the frittata like a pie to serve. Approximately 5 weight watchers points plus for 1/6, or 4 points plus for 1/8. These Muffins are a “Mommy’s on a Diet” original! Far more delicious, and better yet, far lower in calories, than I could have hoped. I’m super happy with how these little gems turned out, and my kids love the little apple butter surprise in the center. 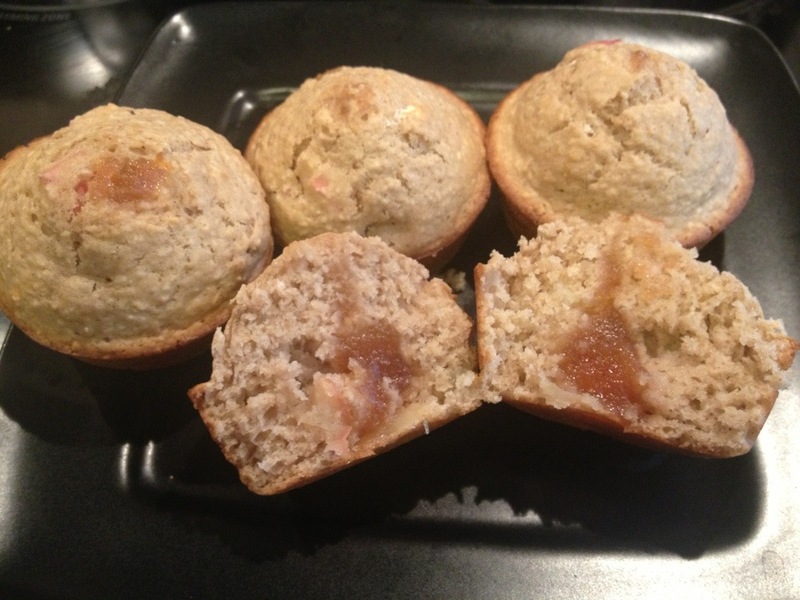 You’ll be hard pressed to find another muffin under 130 calories that tastes this good!!! 1. Place the Oats in a food Processor and chop until they become more like a powder or grainy flour. 2. Mix all Dry ingredients (flour-cinnamon) in a medium sized bowl. 3. In a smaller bowl, mix all wet ingredients except Apple Butter (Egg whites-Lite Syrup). Whisk together until smooth. 4. Add wet ingredients with dry, and stir until everything’s well incorporated. Add Apples and stir them in. 5. Spray a 12 count muffin pan liberally with non-stick spray. 6. Scoop 1/4 cup of muffin batter into each cup. 7. 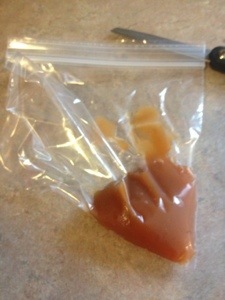 Spoon Apple Butter into one corner of a ziplock baggie. Carefully cut a small piece from the corner of the baggie where the apple butter is contained. This allows you to use the baggie as a piping bag. 8. Dip the cut tip of the baggie into the center of each muffin, and squeeze gently, inserting about 1 tsp of apple butter into the center of each muffin. 9. 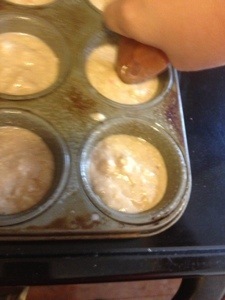 Bake Muffins on 400 for 12-15 minutes, or until they bounce back when touched on the top. 10. Allow to cool about 10 min before serving. Center is hot. Makes 12 Muffins= 128 Calories per muffin! I know, you haven’t read the recipe yet, but I am anticipating that after you do, you might say “why on Earth would I put Ricotta cheese in my pancakes! ?” I’ll answer that question. Although most of us think of ricotta in savory dishes, it can be used in sweet treats too, like a marscapone almost. By adding the ricotta, you get a lighter, fluffier pancake. You can’t taste the “cheese” but it carries the lemon flavor nicely, and also bulks up the pancakes with less calories than if you used more cheeseless batter. Anyway, I liked these little guys. I hope you do too. 1. Mix lemon juice, zest, vanilla, and egg whites in a small bowl. Add milk and whisk until all ingredients are mixed. 2. In a medium sized bowl, mix pancake mix, sugar, and nutmeg. 3. Add wet ingredients to dry, and mix until everything is incorporated and mixture is mostly smooth. 4. Stir in ricotta and blueberries. 5. Heat a large skillet or griddle and spray with nonstick spray. 6. 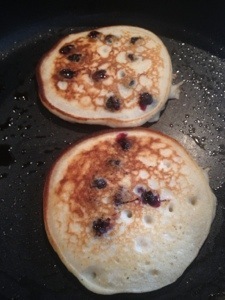 Pour 1/3 cup of batter into pan and cook until you see bubbles form in center of pancake. Flip pancake and continue cooking until golden brown on both sides. 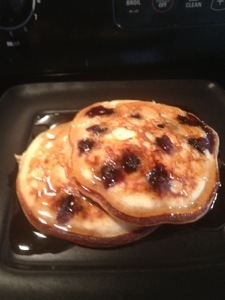 * the pancake mix I used has 220 cal per 1/2 cup. They vary a lot, and I don’t want to throw off your calorie count if you make these at home. Makes 7 pancakes. Serving size = 2 pancakes. Makes 3 1/2 servings. I served with 2 tbsp sugar free syrup, not included in calorie counts shown here. This recipe was delicious, and will definitely be a repeat in my house! We ate them for dinner, because my family is fond of breakfast for dinner. You could use turkey bacon, or ham if you prefer, and add any veggies you might like. 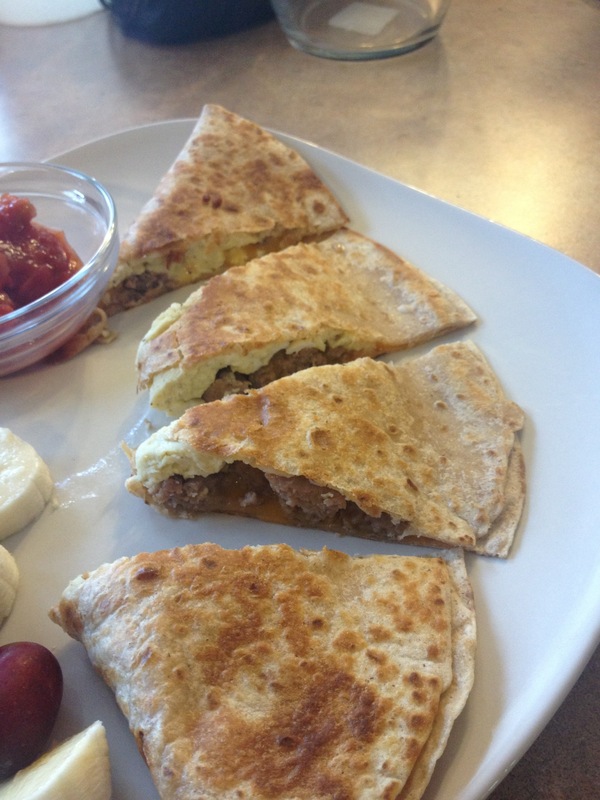 Just try not to over-stuff or your quesadilla won’t close! 1. Coat a small-medium skillet in non-stick spray, and sautéed onions until translucent. Remove from pan. 2. Mix eggs, egg whites, salt and pepper. Re-spray same skillet with nonstick spray, and scramble eggs until cooked through. 3. On a pre-heated large skillet or griddle (heated to 375), spray a generous coating of nonstick spray. Place a tortilla on the hot surface. 4. Cover one half of tortilla with 1/4 of egg, onion, and sausage. Sprinkle 3 TBSP cheese over whole tortilla, slightly heavier on the side with no egg. 5. Fold cheese side of tortilla over egg side, and press with spatula to close tortilla. 6. 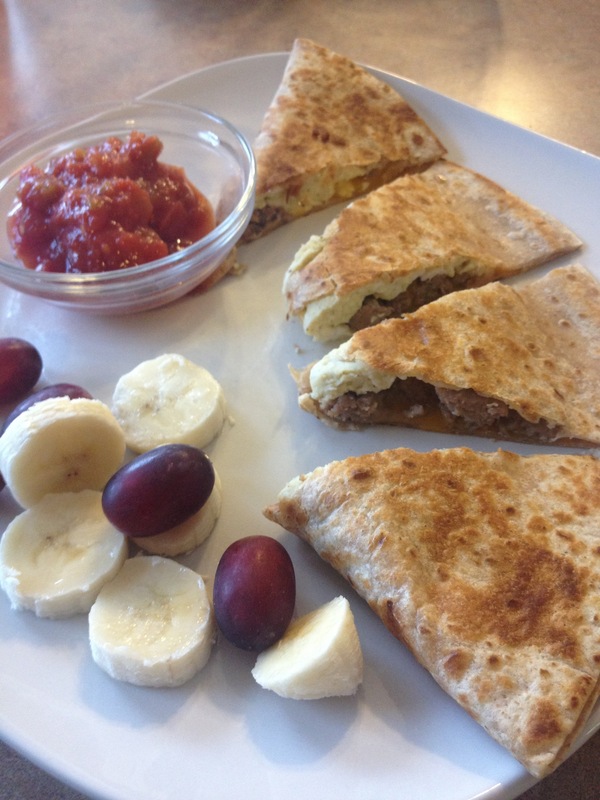 Flip quesadilla and cook on each side until done. 7. Repeat with remaining ingredients. Editors Note: For that extra pop of flavor, serve with 2 tbsp of chunky salsa!